From 1925 until 1927, His Highness Prince Chichibu studied in England. On his way to Europe, he stopped in Okinawa in May 1925. On this occasion, a karate demonstration was organized for him at the Okinawa Shihan Gakkō, the Okinawa Normal School. The leader of the karate demonstration was Miyagi Chōjun, who would later established Gōjū-ryū. While this demonstration is widely known as a karate event, there is another side to it that proves that karate and bōjutsu – staff martial art are inseparable. Located in Maekawa, Tamagusuku, Nanjō City, Okinawa World is one of the major cultural theme parks of Okinawa. 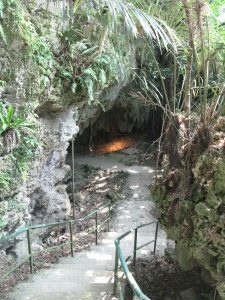 Also known as Gyokusendō for the marvelous limestone cave located inside the park, Okinawa World also managed the Valley of Gangala situated opposite to the main park. Inside the premises can be found the Bugeidō (above photo), a martial art cave that relates to the local staff, Maekawa-bō. 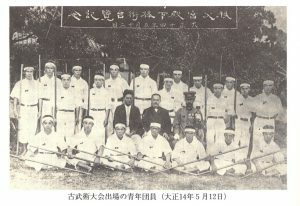 According to a staff member, before WWII and the battle of Okinawa, bōjutsu was performed during local festivals and one of the performing groups used to train inside the Bugeidō. Indeed, there is a large space inside the cave that would allow martial practice. Furthermore, like in many other districts of Okinawa, bōjutsu was popular in the Maekawa district. In the annals previously mentioned, a chapter is dedicated to a particular bōjutsu demonstration. It reads as follow. “On May 12th, 1925, while His Highness Prince Chichibu stopped by Okinawa on the way to Europe, Oshiro Jūrō (Naka ufugushiku gwa), chairman of the Maeda Youth Association, a group once awarded by the Okinawa Prefecture, was asked to perform in front of his highness during a Kobujutsu demonstration as a representative of Tamagusuku Village. The notice from the prefecture was addressed to the ward chief, Oshiro Gensaku. On the date, in the school grounds, a Kobujutsu demonstration with representatives of each municipalities of the prefecture was held. Students of the normal school performed karate and kumite. The Maekawa Youth Association representing Tamagusuku Village performed the kata “Sūji nu kun (Shū shi no kon)” and received a huge ovation from the floor. All travel expenses and uniforms were provided by the Okinawa Prefecture. The valuable document that is the Maekawa records depicts the society of the time and the situation of Okinawan martial arts during the Taishō era (1912-1926). It also tells that martial arts in Okinawa comprised karate (kata? ), kumite and bōjutsu. Today, a monument stands where used to be the Okinawa Shihan Gakkō or Normal school and it is also possible to visit the training site that used to be Bugeidō. As for the Maekawa Youth Association, it is nowadays active as a “performing arts troup”. Next to the traditional dance “Ayagu” (1), it strives to preserve “Yushiguē” (2), “Mēkata-bō” (3) and “Tinbē” (4), performances past down since ancient times in Maekawa. (1) Ayagu is a male dance emphasizing the importance of cooperation between people. (2) Yushiguē is a dance depicting agriculture work with the hoe as main prop. (3) Mēkata-bō is a martial dance performed with a staff. (4) Here, Tinbē is a fighting dance performance using a shield and a blade weapon similar as in traditional kobudō.